I normally save my “bests” and “worsts” for the end of the year, but in the case of trailers, I feel confident that all of the 2012 entries are in. Most of us have mixed feelings about trailers. Certainly, a trailer can ruin the plot of a film. Similarly, being exposed to a trailer too many times can have the opposite of its intended effect. That is, the effective trailer should encourage the maximum number of potential viewers to see the underlying film. But “effective” is surely in the eyes of the beholder. As the beholder, my vote for best trailer of the year would have to go to Looper. I was already a minor fan of writer/director Rian Johnson, but at this time last year, I was skeptical when I heard Johnson would be dabbling in sci-fi with a budget that was relatively modest for the genre. But the trailer did everything that it should within that genre. And while the trailer introduces an intriguing concept, it leaves out an entire subplot that is essential to the film. But this rant is really about my entry for the worst trailer of the year. While other cineastes summarily dismiss director Steven Spielberg as a mere peddler of good-looking crowd-pleasing pap, I was actually impressed with his loose historical epics Schindler’s List (1993) and Munich (2005). In addition, Daniel Day-Lewis – who turned in some of the most enigmatic performances of the last three decades (My Left Foot (1989), In the Name of the Father (1993), There Will Be Blood (2007)) – would be playing the most important figure in U.S. history. 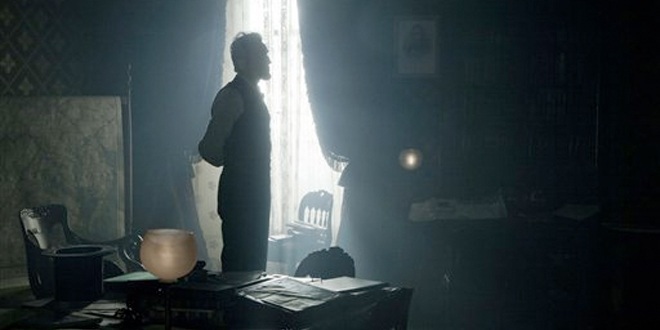 As a viewer (like many) who prefers biopics populated with characters who have at least two dimensions and at least some degree of subtlety to the storytelling, I did have some hope for Spielberg’s Lincoln. It was a simpler time – a time of black and white (in more ways than one) – when the world consisted of Bad Guys [0:45] and Good Guys (cue the reassuring voice of all-American Ameriprise spokesman Tommy Lee Jones!) [1:09]. It was a time we all long for – when our leaders could solve “complex” problems by simply pointing their fingers at their opponents and repeating themselves emphatically [1:02]. Add in some sage advice from the wife – or is it the mother? (cue Forrest’s mom!) [1:16], the comfortably familiar musical flourish [1:24], and you’ve got a story that will make everybody feel as good as THIS (cue the eternally grateful black woman!) [1:58]. We would like to think we live in a world of art-entertainment-commerce where we should not judge a movie by its trailer. But the reality for this viewer (with a couple decades of viewing) is that, in more cases than not, we can.